Zimbabwean president Robert Mugabe speaks at a past function. Coutesy photo. Zimbabwean President Robert Mugabe on Monday presented a cheque of $1 million to the African Union after he and his supporters sold hundreds of cattle in support of the continental body. President Mugabe’s donation was in fulfillment of a pledge he made two years ago that he said caught the attention of his party and Zimbabwean citizens. “I was gratified that this noble cause had resonated well with my party and people who made it possible for my initial pledge to be more than doubled he added.. 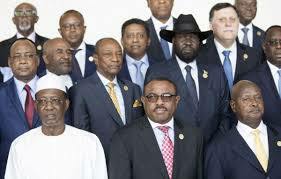 Some of the leaders attending the summit in Addis Ababa. Courtesy photo. No precise figure on the total number of cattle sold was given, although a Zimbabwean local newspaper quoted foreign minister Simbarashe Mumbengegwi as saying it was “thousands”. Mumbengegwi said beneficiaries of Zimbabwe’s land reform programme had donated the animals, which were then auctioned off across the country. 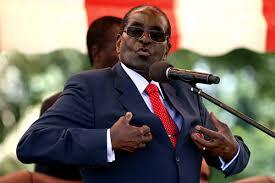 In his comments to the AU on Monday, Mugabe said the idea of donating cattle had been a natural one for him. “A donation of cattle came naturally to me given that our continent is rich in cattle and cattle are held as a store of wealth,” he said. Mugabe, who was AU chairperson from 2015-2016, has often called for the body to be self-funded. For years, about 60 percent of AU spending has been financed by donors including the European Union, World Bank and governments of wealthy non-African countries. President Mugabe, one of Africa’s controversial leaders, who has held power in Zimbabwe since independence from Britain in 1980, has said reliance on foreign funds allows big powers to interfere in the work of the AU. The 93-year-old leader, who is accused of presiding over a ruined economy, said he had auctioned 300 cattle from his personal herd in May to fulfil the pledge.”This humble gesture on Zimbabwe’s part has no universal application but it demonstrates what is possible when people apply their minds to tasks before them,” Mugabe said. 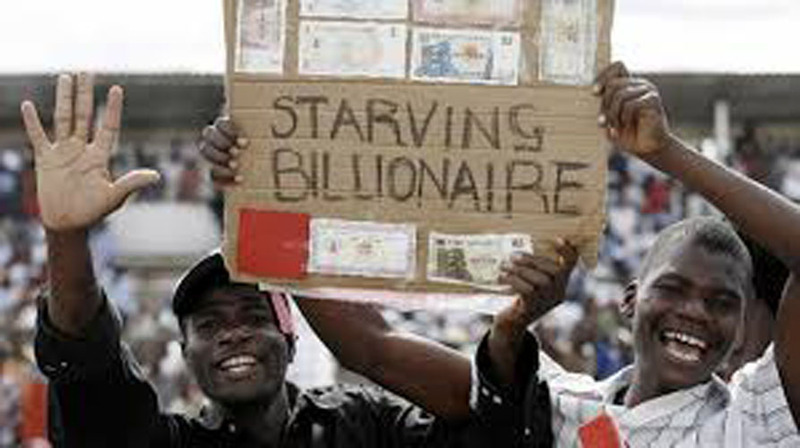 Zimbabwean citizens protest rampant inflation. Critics accuse Mugabe of failure to stabilise the country’s economy. Courtesy photo. The African Union’s 2017 budget is $782 million, increasing from $416.8 million last year. African leaders in July 2016 agreed in principle to charge a 0.2 percent levy on some exports to help finance AU operations. Meanwhile, Guinean President and current AU Chairman, Alpha Conde, has urged Africa governments to invest more in African youths in order to develop their confidence and potential. According to a State House press release, President Conde challenged leaders to focus on transforming their countries and work towards AU’s commitment that aims at silencing the gun on the continent by 2020 and making Africa a haven of peace. On his part, the AU Commission Chairman, Chad’s Moussa Faki Muhammed, called on leaders to accelerate economic development, reduce marginalisation of women and address challenges confronting the African youths today. The assembly was also addressed by the United Nations deputy Secretary General, Ms Amina Muhammed, who among other things, commended Uganda for not only welcoming refugees, but also integrating them in local communities.